This recipe makes around 36 mince pies. Make the mincemeat. Mix all of the ingredients apart from the caster sugar into the mixing bowl. Use a food processor to make a finer mincemeat. Preheat the oven to 200ºC or 400ºF. Grease or flour the muffin tin. Make the pie pastry. Sift the flour and salt into a clean mixing bowl. Add the sunflower spread and using your fingertips, gently and quickly rub the fat into the flour. The mix is ready when it resembles breadcrumbs. Pour in the cold water. Press the mix together to form a dough. Remove from the bowl and place on a floured surface. Roll out fairly thinly. Cut 12 centimeter (4 3/4″) circles and 10 centimeter (4″) circles from the dough with round cutters. Press a larger circle into the muffin tin. 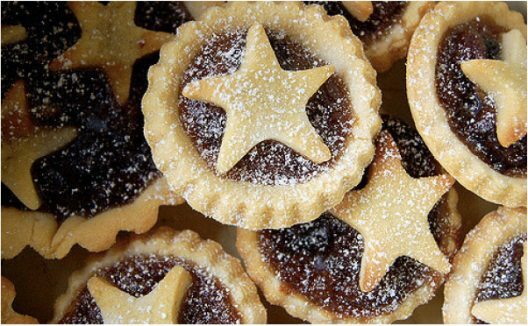 Place a heaped teaspoon of mincemeat into the middle of the pastry. Cover with a smaller circle. Repeat until all circles have been turned into mincemeat pies. Press fork tines around the edges of each pie to seal closed and stab a fork in the middle. Alternatively, simply pinch the edges together and make one small neat hole in the middle of each. Place into the preheated oven and bake for around 10 minutes or until the pies start to brown lightly. Remove from the oven. Place the muffin tin on the cooling rack and leave to cool. Sprinkle with the sugar. Serve warm or cold. Grease a square baking tin (roughly 20cm) with a little oil, line with greaseproof paper. Break 150g of chocolate into a bowl and melt over a pan of boiling water, set aside to cool slightly. Sieve the flour and cocoa powder into a large bowl, then stir in the sugar and a pinch of salt. Halve the vanilla pod lengthways, scrape out the seeds, then add them to the bowl. Stir in the oil, soya milk and melted chocolate until combined. Put white flour, spelt flour, bicarb, baking powder, sugar, salt and cinnamon in a bowl. Blend the oil and vanilla extract in a jug and add to the dry ingredients, stir gently until combined. Add raisins, chocolate, brazils and water, mix gently and thoroughly – mixture should be clumpy and quite moist. Using a spoon or just your hands (easier!) make small balls, place onto baking tray and press down gently into fat cookie shapes. Leave at least 5cm gap between cookies as they expand in the oven. Pop into oven and bake for 10-­‐12 mins, rotating the tin once halfway. Eat and enjoy as soon as they are cool enough. I have played around with this recipe, you can reduce the sugar by up to 20/30g and substitute with dessicated coconut, cocoa powder or linseed. The flour is flexible too, try different combinations I have used all spelt, or part rye. Other nuts work too -­‐ never forget the chocolate though!